This image shows the two galaxies interacting. NGC 2936, once a standard spiral galaxy, and NGC 2937, a smaller elliptical, bear a striking resemblance to a penguin guarding its egg. Image released June 20, 2013. 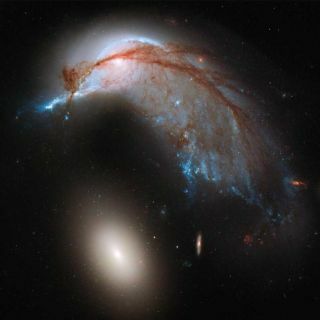 A cosmic penguin shines 326 million light-years from Earth in a stunning new photo from the Hubble Space Telescope. While the celestial bird, which lies in the constellation Hydra, looks tranquil enough, the photo actually shows two galaxies colliding into each other, scientists say. Blue wisps that create the body of the penguin are the warped guts of the spiral galaxy NGC 2936. A bright blob at the bottom left that looks like the penguin's egg is actually a second, elliptical galaxy, NGC 2937, responsible for tearing its companion asunder. Together, the pair is known as Arp 142. "The eye of the penguin is all that remains of NGC 2936, once a spiral galaxy like our Milky Way," Joe Liske, a European Space Agency astronomer, said in a video explaining the Arp 142 galaxy crash. "Its disrupted arms streak down through this image, shaping the cosmic bird's body as a cascade of blue and red." The Hubble Space Telescope photo holds other surprises as well. Two bright stars shine at the top of the photo. The star on the right appears to have a streaking blue tail emanating from its core. The tail is actually another galaxy, but experts think that it is too far away to interact with Arp 142. Distant blue and red galaxies also dot the image, surrounding the two merging galaxies. This image shows the two galaxies interacting. NGC 2936, once a standard spiral galaxy, and NGC 2937, a smaller elliptical, bear a striking resemblance to a penguin guarding its egg. "When two galaxies collide, they can be rendered unrecognizable as vast clouds of gas and dust race towards each other, crashing forcefully and sparking bursts of star formation," Liske said. "Hubble has been able to capture some of these mergers, providing us with beautiful astronomical images and an insight into these turbulent events." Hubble is a joint operation between NASA and ESA. The telescope was launched in 1990 and since that time has photographed many distant features of the universe. NASA hopes to keep Hubble operational until at least 2018, when the James Webb Space Telescope, its successor, is set for launch.